Goblins + Zombies = What Can Go Wrong? I’ll admit that the Bodgers games from Privateer Press don’t have the best reputation for being good games (and there are sometimes when I agree), but they are fun. Despite my warm reviews of most of the bodger games so far, I will admit that they aren’t the creme of the crop by any means but you need to remember that bad games can still be fun. Maybe I just have bad taste, I don’t care either way. Anyway, today I’m here to bring you a surprisingly refreshing game from the bodgers line and I hope you’ll give it a chance before shouting for it to “get off your lawn”! Let’s keep in mind that Zombies Keep Out seems to be aimed at a younger crowd (8+), possibly the youngest yet. Also, speaking of lawns, the game seems to borrow moderately from another certain very popular game involving ballistic botanicals and the undead, but don’t judge it just yet. 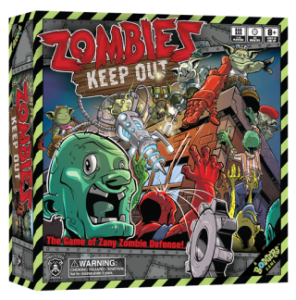 I have played several games so far both with kids, adults, and a mix of both and I can safely say that Zombies Keep Out is definitely approachable for the younger crowd…if they don’t mind occasionally utter and crushing defeat. In ZKO you and up to 5 other friends play a wild bunch of Bodgers who are trying to construct 3 out of 5 randomly selected (15 total) piecemeal contraptions from scrap parts to destroy and fend off zombies before they can breach your workshop. If they get t through the front door, or overrun any 3 of the 5 locations you’re defending on the board, you’ll be on the losing side of Bodger/Zombie history. Otherwise, you win the zombie war! The contraptions range from Deathrockets, Boomflingers, and Meganailers to robot healers and contraptions that will help you build other contraptions. 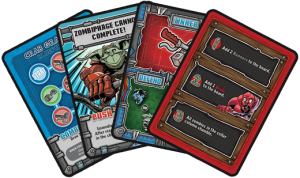 You’ll be assembling these contraptions with the parts cards that you pick up during the game, they also serve as a means to slay zombies and barricade your workshop as well. Since they are random, each game has a bit of a unique feel to it as far as what goals you’re working toward and how the contraptions help you reach them. Unfortunately some contraptions are arguably “better” than others depending on the situation, and there is only 1 out of the 15 available that allow you to remove bite tokens. Actually, as far as I know, this one contraption (Robot Doc) is the only way to lose bite tokens in this game. What are bit tokens you ask? Basically, the more you have the less able you are to help your teammates, they create a sort of snowball effect that can really hurt you late game but sometimes they are honestly the best option – as opposed to loading up the board with more zombies or having them pile up so bad they break several barriers at once. The max number you can have is 4, at which point you are basically a zombie and can only cause havoc for your former comrades within the workshop. 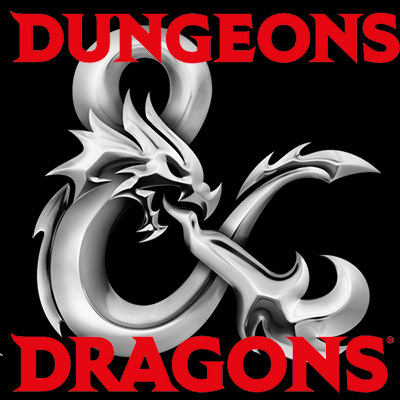 There is a roleplaying element tied to bite tokens too, wherein players are instructed to gradually moan/grunt more while playing depending on the number of tokens they have – kids will get a kick out of that little tidbit for sure. Tinker – Discard one of your parts cards to place its corresponding part (sprockets, levers, etc.) to help build one of your Contraptions. 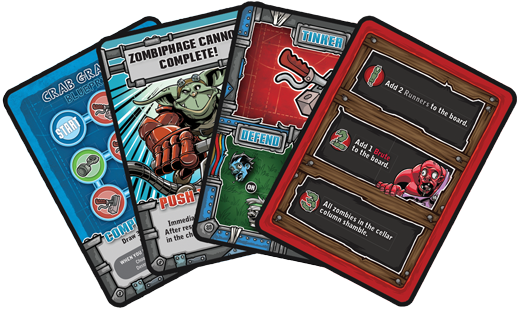 Defend – Discard as many of your parts cards that you want simultaneously to clear out the type/color of zombies indicated (if any) on a single space on the board. You are also able to trade a single card with another player either before or after you perform this action, so long as neither yourself or your desired trade partner don’t have any bite tokens. ZKO is often a game played where all players have their cards face up in front of them so that everyone can work together in figuring out the best order of operations. I think the main takeaway from Zombies Keep Out is that it’s a game that is going to keep you constantly feeling unsafe, you’ll stand on the precipice of losing the entire game more often than not. This is a good thing, considering it’s a zombie game. 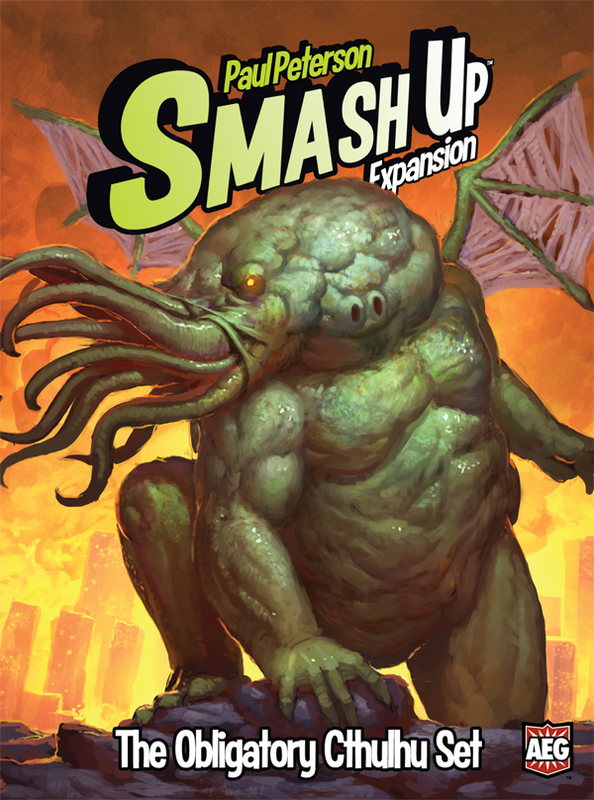 It’s good fun for a family game night, and might make for good filler in between other games as long as you don’t put too much thought into it (otherwise it can kind of drag). The randomness, the fact that bite tokens have only a single method of removal that relies upon a completed contraption that you’ll only see (statistically) in about 1/3 of the games you play, and the tendency to be one of those games where the planner type in your group starts prematurely taking peoples turns for them means it might not be for everybody. ZKO is a game that doesn’t take itself too seriously, and I don’t think we should either. If you want more nitty gritty on the rules before making up your mind, be sure to check out the full tutorial on YouTube. It should go without saying that the components are great quality, colorful, and the box is minimalistic. The presentation on Privateer’s products are some of the best in the industry. So if you’re looking for a fun way to introduce some colorful zombie mayhem to your game collection, especially if you have younger kids I’d definitely say pick this up. If not, you might want to proceed with caution. You can snag it on Amazon for right around $25.